Bala & Penllyn is located in the Welsh Lake District, Snowdonia, Wales - an area ideally situated for walking. There are a wide variety of walks, ranging from short scenic walks to strenuous ones - climbing mountains almost 3,000 feet high. A feature of the area is that walkers can enjoy the mountain experience without the crowds - that are sometimes found in the busier parts of Snowdonia or The Lakes. Bala has achieved "Walkers are Welcome" status and many accommodation provides provide walker friendly accommodation under the VisitWales criteria. The leaflets and brochures can be downloaded from GoBala or collected from the Tourist Information Point at the Leisure Centre in Bala. One of the highlights of the area is to walk around Bala Lake (14 miles) using footpaths on the surrounding hills with excellent views - this can be split into two more leisurely walks (8 or 6 miles) using the Bala Lake Railway or local bus service for return transport. The walk covers a variety of land including farmland, moorland, forestry and provides an overview of Penllyn and the adjacent mountain ranges (Aran, Arenig and Berwyn). If you require a walking guide for the Bala area or in Snowdonia go to Guided Walking. To the south of Bala is the Aran mountain range with 14 summits above 2000 ft (610 m). The Aran ridge covers the principal summits including Aran Fawddwy (2969 ft/905 m) and Aran Benllyn (2904 ft/885 m). The ridge makes an excellent linear walk including both major summits, utilising the local bus service for return transport. Rhobell Fawr (734m) with Dduallt (662m): two contrasting hills that can be combined into one walk. The Arenig area is designated as a Site of Special Scientific Interest (SSSI). Both Arenig Fawr and Arenig Fach have tarns situated in glaciated corries with steep crags; the south ridge of Arenig Fawr is a pleasant rocky ridge. To the east and north-east of Bala is the Berwyn mountain range with 24 summits above 2000 ft (610 m). The western side of the Berwyn mountain range is easily reached from Bala, e.g. starting from Llandrillo or Cynwyd and also from the Bala to Llanygynog road; whereas the eastern side is further away but can be combined with a visit to Wales’s tallest waterfall “Pistyll Rhaeadr” at Tan-y-pistyll The three principle summits can be climbed in one circular walk, including:Cadair Berwyn (2723 m/ft 830 m), Moel Sych (827 m/2710 ft) and Cadair Bronwen (827 m/2710 ft). In addition to the three local mountain ranges (Arenig, Aran, Berwyn) Cadair Idris and the Rhinog mountains, are a short drive away. Other parts of Snowdonia are also easily accessible including Snowdon, the Glyders, Tryfan, Carneddau, Cnicht and the Nantlle ridge. Three Peaks circuit in Snowdonia (April 2010): which comprises Arenig Fawr, Moel Llyfnant and Arenig Fach. Bala makes an ideal base close to these three peaks and there is many other mountains to climb, including the twin peaks of the Arans. Secret Snowdonia (April 2012) an article on the Bala area which features Arenig Fawr and includes Aran Fawddwy. The article states that: the Arenigs get better weather in the east than the main Snowdon ranges in the west. Ultimate Weekend - Bala (May 2012): "A lovely lakeside town that's a great place to base yourself for a weekend of Welsh hillwalking" with routes for Aran Fawddwy, Moel y Garnedd and Arenig Fawr. Walks around Y Bala and Penllyn – a third updated edition, now containing 22 walks, exploring the beautiful unspoilt landscape and rich Welsh cultural history of Y Bala in the southern part of the Snowdonia National Park, and its adjoining area. The book contains a town trail, walks on hills, by rivers, through woodland and a superb upland circuit of Llyn Tegid. It visits great viewpoints and places of historical interest. Mary Jones Walk – The 28-mile walk by a 15-year-old girl, from Llanfihangel-y-Pennant Llanycil (Bala), helped inspire the founding of Bible Society. You don't have to do it barefoot! Download the route description from GoBala. Coed y Brenin although better know for mountain biking has many excellent walks. Precipice Walk is considered to be one of the classic short walks of Snowdonia and is included in the six "Great British Views", by the Rambler's Association (see Walk, winter 2008). Its described as a family-friendly ramble over mostly level ground and provides unrivaled views of the Mawddach estuary and Cader Idris. The Mawddach Trail, which runs from Dolgellau to Barmouth, was featured on BBC2 "Railway Walks" with Julia Bradbury. 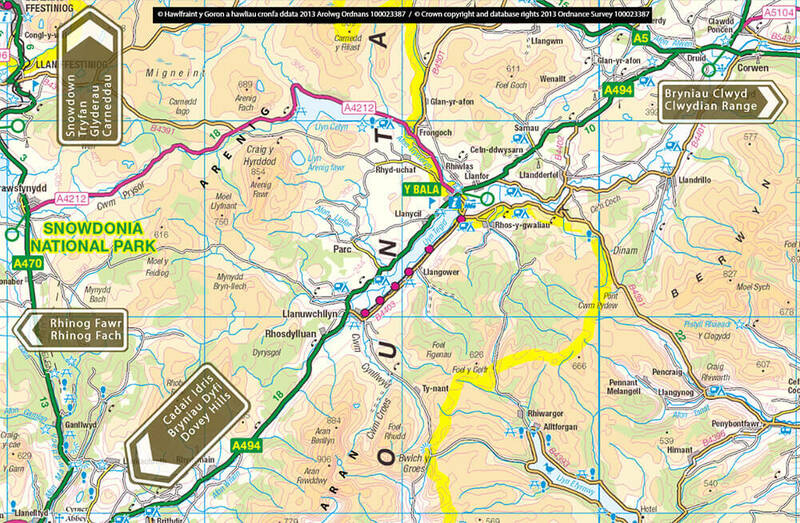 Snowdonia National Park Authority (SNPA) information for the Mawddach Trail. A walk to the top of Pistyll Rhaeadr, the tallest waterfall in Wales, near Llanrhaeadr-ym-Mochnant, is one of The Times 50 Best Walks. Safety statement from the British Mountaineering Council (BMC): The BMC recognises that climbing, hill walking and mountaineering are activities with a danger of personal injury or death. Participants in these activities should be aware of and accept these risks and be responsible for their own actions. Also see safety information using links on the right.